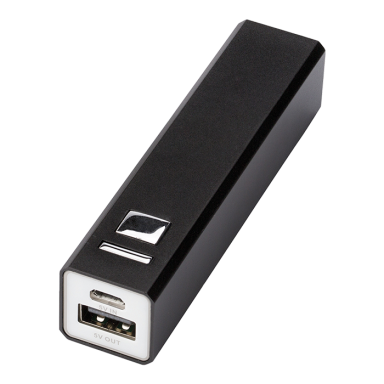 This little battery backup will keep your mobile devices charged up. The 2,200 mAh internal Li-Ion Grade A battery has enough life to fully charge an iPhone, giving you about 8 hours of additional talk time. The LED digital power indicator will confirm exactly how much charge remains within the power bank. The 5V/1A USB output means that it charges at the same rate of most wall chargers. Includes a USB to Micro USB connecting cable which can recharge the battery backup or be used to charge up devices with a Micro USB input like Android Smartphones from Samsung, Motorola, HTC, Nokia, and others. Our batteries have undergone evaluation for numerous quality standards. aluminium 9.1 ( l ) x 2.3 ( w ) x 2.3 ( h ) lithium ion battery safety: over charge, over discharge, over load & short circuit protection 2200mAh Supplied in a black window presentation box. Includes a black microfiber pouch.